Total Freight International was awarded the ‘Certificate of Appreciation’ by Etihad Airways for their outstanding performance during the year 2012, and was one of the 10 agents among over 4000 others in Dubai. 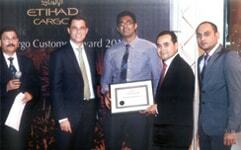 The award is presented based on the volume of cargo that is sent out to the various sectors serviced by Etihad Airways. The award presented by Etihad Airways highlights Total Freights strength to frequently service various parts of the world, which is only possible with the help of our dedicated team of sales force who work strenuously in meeting our client’s expectation at the highest level of service. This award has only been made possible with the constant support of our clients in both the local and the overseas market. Total Freight International looks forward to increasing volumes with Etihad and their emerging sectors, which will enable us to provide the best services for our clients.